Provided by the author. All opinions expressed are my own. Yesterday we visited central Asia with a friendly dog, and today we are visiting the oceans surrounding Australia with some very bright cetaceans and the people who study them. 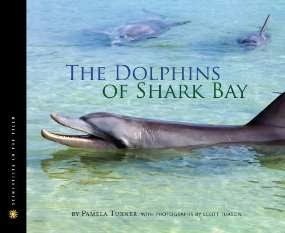 This is an absolutely brilliant book about some bottlenose dolphins, the respectful and knowledgeable crew of the Pomboo, and about what we know about animal families and cultures. We learn that these sponging dolphins learned their tool craft from the generations before them. We learn to analyze these behaviours and compare them to other animal families, like primates, both human and non-human, just like an anthropologist does. Turner writes a compelling story with a fascinating cast of characters. From dolphins like Reggae who hunt beaches to non-sponging Guppy, they are all fascinating on their own. But it is their relationships with each other that will give young readers the biggest thrill. It's like an underwater episode of Degrassi High. Who dates whom? Who is friends with whom? Who copies whose behaviour? Who is whose rival for a popular dolphin's affection? It's all endearingly complex. This is an ideal book for budding anthropologists or marine biologists to pick up. But more than that, it would appeal to surfers or fans of Sweet Valley High-esque books willing to branch out to nonfiction. The book has wide appeal. We loved it. This post is for Nonfiction Monday, hosted this week by Tammy at Apples with Many Seeds. I love this series. And this sounds like an excellent addition. Dolphins are always appealing to read about. Thanks for taking part in today's Nonfiction Monday event.